Helping individuals flourish with improved quality, efficiency, effectiveness, and motivation. GOAL/QPC is a leader in the world of Quality Management. 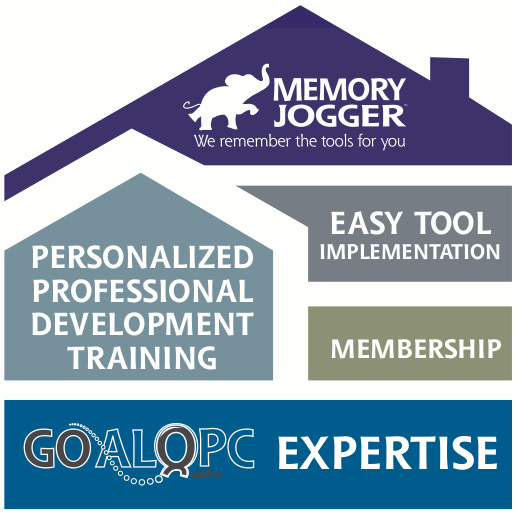 GOAL/QPC’s concisely written pocket guides, known as Memory Joggers, enable people at all organizational levels to learn and apply tools, methods, and processes that are critical to attaining world-class organizational excellence. With over 12 million copies in circulation, our customers value our Memory Joggers as stand-alone learning resources or for use in a training environment. Made popular with our trademark format of “Why use it? What does it do? How do I do it?” and published in a pocket sized spiral binding, users can quickly find and acquire knowledge and insight from our leading edge book content. GOAL/QPC’s onsite workshops help people at all organizational levels learn and apply tools, methods, and processes that are critically needed to attain world-class organizational excellence. Workshops focus on such areas as strategic planning, problem-solving, project management, time management, facilitation skills, lean improvement, and concept engineering. We are an organization focused on helping teams and individuals be and produce their best. Over 12 million Memory Jogger pocket guides, together with aligned training course materials have helped improve organizations, resulting in strong, effective, employees producing the best for their colleagues and customers.